Arthur Peacocke was a British Anglican theologian and biochemist. Arthur Robert Peacocke was born at Watford on 29 November 1924. He was educated at Watford Grammar School for Boys, Exeter College, Oxford (BA 1945, MA 1948, BSc 1947, DPhil 1948, DSc 1962, DD 1982), and the University of Birmingham (DipTh 1960, BD 1971). He taught at the University of Birmingham from 1948 until 1959 when he was appointed University Lecturer in Biochemistry in the University of Oxford and Fellow and Tutor of St Peter’s College. 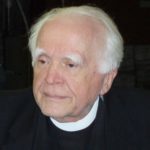 In 1960 he was licensed as a Lay Reader for the Diocese of Oxford and he held this position until 1971, when he was ordained deacon and priest, unusually, both in the same year. "God is creating at every moment of the world’s existence in and through the perpetually endowed creativity of the very stuff of the world."